This thing showed up this week by the fountain on Market Square. It's the interweb outside!!! 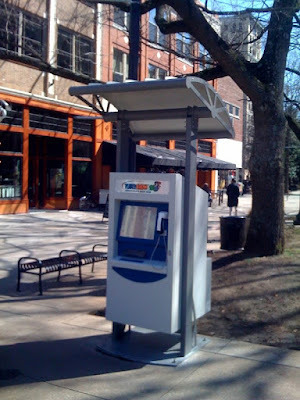 Knoxville's "Data Dog" will "fetch" you info about what to do and where to go in town. When I clicked on "Restaurants" the first things on the list were Domino's on the Strip and Baskin Robbins on Clinton Hwy. Oh well, A for Effort. On a slightly related note, the city actually delivered on its promise today and replaced the old pear trees on Union beside MS Kitchen. Now, either replace the tree near the stage or cut the other one down. The people demand symmetry! 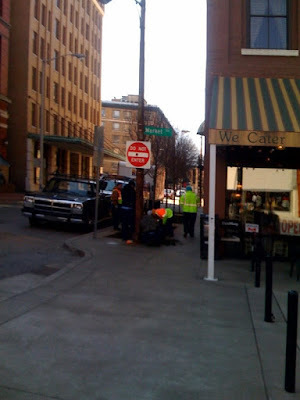 And what about all those empty tree holes around downtown? Let's keep this going, Knoxville. Clinton Highway? Is that where the food is? Perfect. I'm really hungry. stupid anti-downtown machine. of course it would skip like 20 restaurants that could spit on it if they wanted. that is, if restaurants could spit. seriously though. i saw that thing during the mardi dog parade the other day and realized that it is called "data dog" which i then thought had something to do with said parade. i was really confused. especially because it wasn't wearing any beads. Wait, isn't that where the women's suffrage statue used to be? that statue's on the other side..
PS to wigshoppers: i just got to hang out with stan and lucas! it was very good to see them and discuss the blog with our founder.